LatinaStyle officially recognized Marriott International as the 2010 "Company of the Year" at its annual awards and diversity leadership conference held Friday, February 4th, 2011. Bill Marriott was the keynote speaker during the luncheon. "Our company’s early success has an interesting connection to Latinas," he shared. "My mother, Alice S. Marriott, majored in Spanish while in college. Maybe it was my mother’s love of the Spanish language and heritage that influenced us. But my family has always loved Latin America. "Just over a year ago, I traveled to Colombia for the first time to attend the grand opening of our first hotel in Bogota. While I was there, I had the opportunity to meet President Uribe, who has done wonders for the reputation and business environment in Colombia, making it a prime travel destination in South America. He attended our grand opening and welcomed us officially to his country. It was a wonderful trip to a great country." 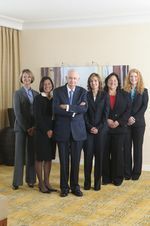 Further recognition in 2010 for the company's diversity and inclusion achievements included being ranked seventh on DiversityInc's “Top 50 Companies for Diversity” list, and among the “Top 50 Companies for Executive Women” by the National Association for Female Executives. In 2003, Marriott’s Board of Directors established the Committee for Excellence, chaired today by board member Debra L. Lee, chairman and CEO of BET Networks, to monitor the progress of the company’s diversity initiatives. Marriott International, Inc., is a leading lodging company with more than 3,500 lodging properties in 70 countries and territories, and develops and operates vacation ownership resorts under the Marriott Vacation Club, The Ritz-Carlton Destination Club, and Grand Residences by Marriott brands. It is ranked as the lodging industry’s most admired company and one of the best companies to work for by Fortune Magazine. Pictured: Accepting the award from Robert Bard, LatinaStyle’s president and CEO are Bill Marriott, chairman and CEO, and Brenda Durham, vice president and assistant general counsel for Marriott.